Here at Shanee Prana we offer you an opportunity to become aware of who you are, learn about yourself, rest your mind and body, enrich and rejuvenate yourself. The name Shanee Prana is derived from two sources – ‘Shanee’ originating for the old testament, meaning beautiful and the Sanskrit word ‘Prana’ meaning energy. The name Shanee Prana perfectly describes our property. The accommodation has 5 bedrooms, 3 bathrooms one a with Japanese style spa, 4 rest rooms, outside shower with hot water near the pool. It’s very elegant and comfortable property enveloped with beautiful silky oak windows and French doors. The kitchen has a commercial size gas stove and oven, double door fridge with ice making facility. A Huge outdoor covered patio with a gas BBQ, outdoor oak table and chairs near the pool and wrap around open patios around the house with lounge chairs. The family room has comfortable lounges, large LCD TV, sound system, dining table with capacity to seat 12. The kitchen is open plan with a family room and breakfast bar with high chairs. A second lounge room has adaptable lounges that can potentially sleep another 2 people, it also has a large LCD TV and DVD player. Master bedroom Queen size bed with views over the Macalister Ranges, LCD TV, en suite with spa and separate toilet. Twin singles bedroom interconnecting with the master bedroom and has a LCD TV. Twin singles bedroom overlooking the beautiful interior garden. King singles bedroom This can be made in to 1 super king bed and has secluded rear garden views. King size bedroom Has an en suite and toilet. 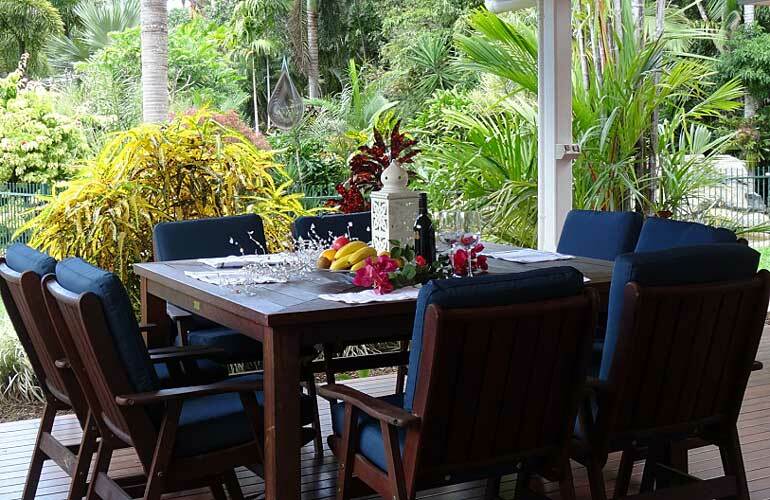 The property has beautiful gardens situated on acreage facing the tropical rainforest of the beautiful Macalister Ranges at Kewarra Beach near Cairns. Suitable for holiday house accommodation, yoga retreats, family gatherings, corporate meetings, workshops and boutique weddings. Shanee is a fully equipped holiday house with everything needed for your perfect stay including bed linen and towels.